Wait! Don't close the window just yet. 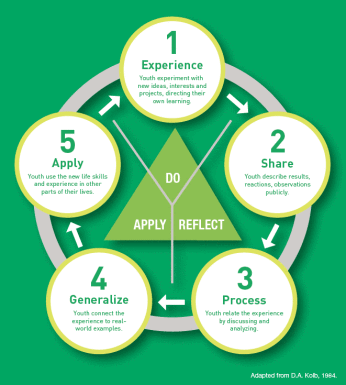 I know that just reading the words "Experiential Learning Model" might not seem that interesting, however, it's a hallmark of our 4-H programming and actually, it's very interesting! The basic principle of the model is that by "doing" a child is more likely to learn and understand. Granted, there are multiple ways to take in information, but by their busy nature children are on the move and constantly exploring. So this is a natural opportunity for them to use their senses, make decisions, and generally be involved with their learning. Through our Extension courses we have learned the five steps and understand the process of using this model, however, often we are so focused on the EXPERIENCE that we do not spend enough time on the next four steps. Our 4-H motto, "Learn by Doing" encourages club meetings, workshops, demonstration days, and other 4-H events to be hands on and youth lead. After the experience the agents role comes into play. Leading the sharing and processing is a critical step for youth to recognize that the new skill set will be something that they can apply to their life. The teenage group has the benefit of using their knowledge gained through 4-H to reach and teach younger children. They are taught how to share, process, generalize, and apply from their first experiences as 4th graders and understand that providing experiences and spending time reflecting children will be successful. This is evident in observing teens demonstrating how to make a camp bunk and other life skills that naturally fall into place. Want to dig deeper? Please check out the article below from the University of Florida-Using an Experiential Model in 4-H.